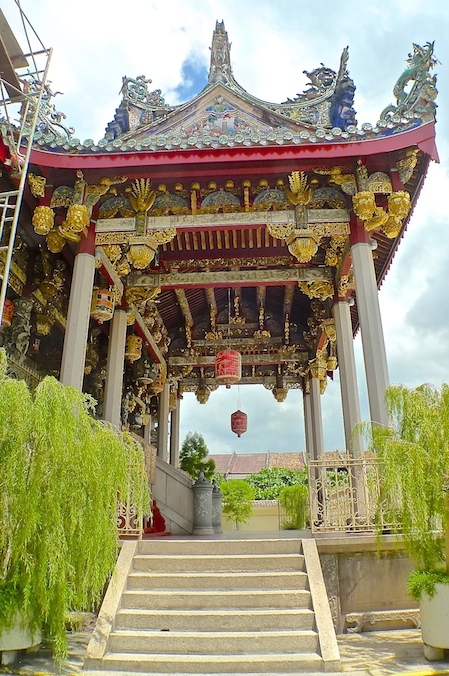 On my third day in Penang, I visited the Leong San Tong Khoo Kongsi, one of the finest and grandest Chinese clan temples in Malaysia. Housed within Cannon Square in George Town, it is listed as a UNESCO World Heritage site and known as an icon for heritage conservation. The entrance to Cannon Square and Leong San Tong Khoo Kongsi (or Khoo Kongsi for short) is located along Cannon Street. However before entering the clan temple, I could not help admiring these pre-war colonial houses located opposite. I thought these buildings were pretty charming! This is the entrance to Khoo Kongsi. By the way, the name Leong San Tong literally translates as Dragon Mountain Hall. 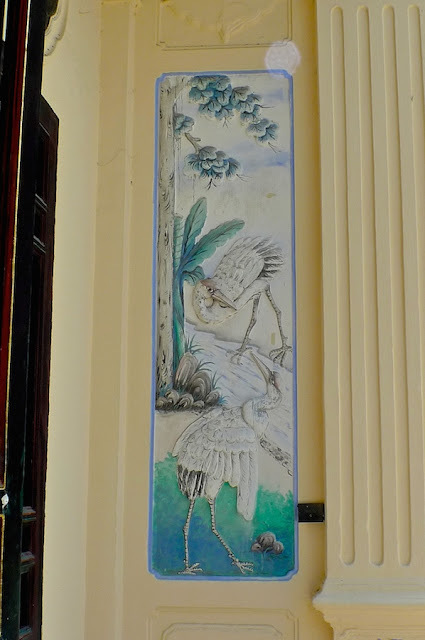 There's a brief historical description of Khoo Kongsi on the wall. 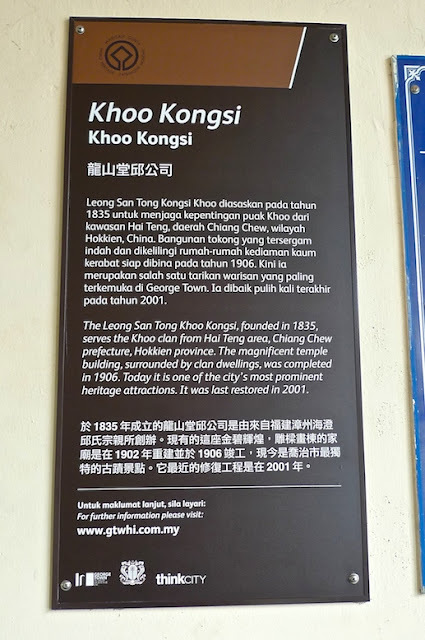 Apparently, Khoo Kongsi was founded in 1835 when members of the Khoo clan gathered to form an association to look after the welfare of Khoo clansmen who made their journey from China to the promised new world of Malaya. Khoo Kongsi were known as one of the Five Big Clans that formed the backbone of the Hokkien community during the early days of Penang - the other four being Cheah, Yeoh, Lim and Tan Kongsi. The building now standing was actually rebuilt from scratch after the original building was destroyed by a mysterious fire in 1901. It was partially damaged in World War II but restoration work was done to fully reinstate it to its former glory in 1958. The last major restoration was done as recent as 2001. This plaque on the wall certifies that the Khoo Kongsi building was registered as a Heritage building by the Malaysian Government. The entrance into Cannon Square was flanked by double-storey terrace houses on both sides. They are known as 'Sixteen Houses' because there are 16 of them - 8 on each side. There were not many people at the time of my visit, which was a good thing as I simply dislike crowds. At the end of the Sixteen Houses was a shop selling tickets and souvenirs. The entrance fee was RM10 (US$3.15). 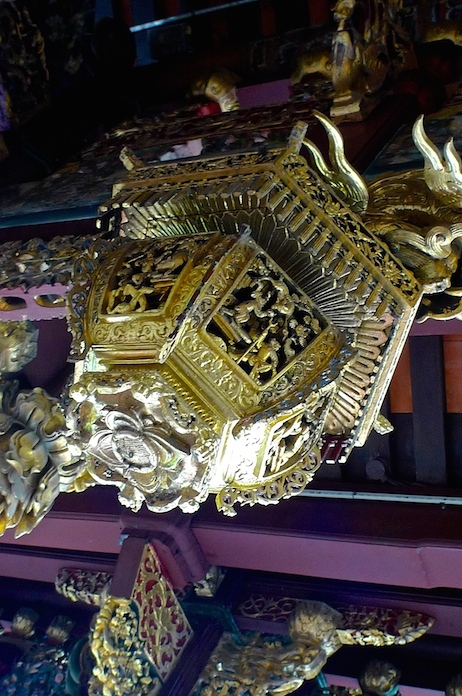 The Khoo Kongsi complex consists of the Leong San Tong clan temple, an administrative building with meeting hall and offices, an opera stage and 62 units of terrace houses and shophouses. 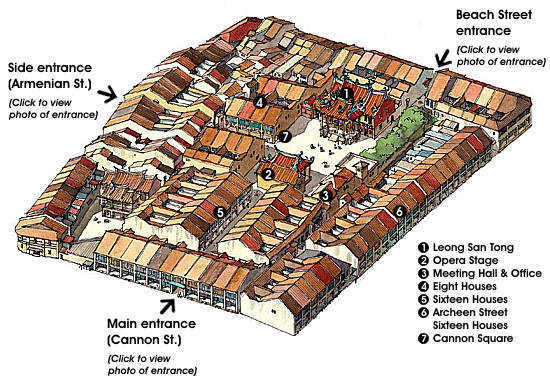 Refer to this diagram taken from the Khoo Kongsi website below. Notice there are 3 entrances to the Khoo Kongsi complex but I think only the main entrance at Cannon Street is open. I could imagine that in the olden days, this whole area is like a self-contained village occupied by the Khoo families. Round the corner after the Sixteen Houses stands the Administrative Building. This is the place where clansmen hold meetings and settle clan affairs. This double storey building looks interesting as it has some elements of British colonial architecture. I was just curious about those blue-coloured designs on the wall. Not sure what they symbolise or if they have anything to do with feng shui. I stepped inside and was surprised to find ancestral tablets. I thought this is an administrative building! 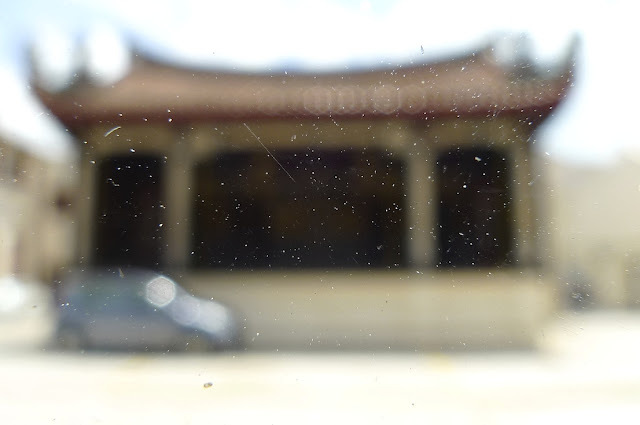 On further research while writing this post, I learnt that this is an extension from the Leong San Tong temple as the altar for the enshrinement of ancestral tablets at the Leong San Tong was overcrowded. There were some nice carvings on the wall. Leaving the Administrative Building, I walked towards the Opera Stage. I tried to take a picture but my camera got jammed midway. And the picture ended up like this! OK, this is the picture of the Opera Stage after my camera behaved itself. LOL. I took it standing in the middle of the courtyard. Directly opposite the Opera Stage is the Leong San Tong clan temple. Look at the detailed ornamentation on the rooftop! What a masterpiece! Pieces of ceramic bowls were used to form all those patterns and images probably using the cut-and-paste method. The roof must be pretty heavy! There were four staircases leading up to the Prayer Pavilion in front of the building. The two front stairs were blocked so I entered using the side staircase. Look at the ceiling - it was full of intricate ornamentation and design! A closer shot of the Pavilion's ceiling. Big lanterns and images of carved celestial animals make this clan temple a perfect place for avid photographers. The Leong San Tong clan temple is a two-storey building. The top floor consists of three halls - the Main Central Hall, the Ancestral Hall on the left and the God of Prosperity Hall on the right. The ground floor consists of a museum and a kitchen. A grand staircase leads up to the Main Hall from the Pavilion. The ceiling outside the Main Hall. Beautiful, intricate carvings! Must have been done by master craftsmen! Standing outside the Main Hall, I snapped a picture of the courtyard below and the Opera Stage in the distance directly opposite. To the left of the Opera House is the Administrative Building which I visited earlier. This is the verandah outside the Main Hall. Look at those ornate wall carvings! They are pretty amazing! A closer shot of the beautiful carvings. A relief sculpture of a mythical animal. I love this round stone window! I am pretty sure each carving tells a different story. I am just not sure what story. I spent the entire afternoon clicking away with my camera haha! Unfortunately, my pictures were just average at best. If you own a really good DSLR camera, you should visit this place and take gorgeous photos! 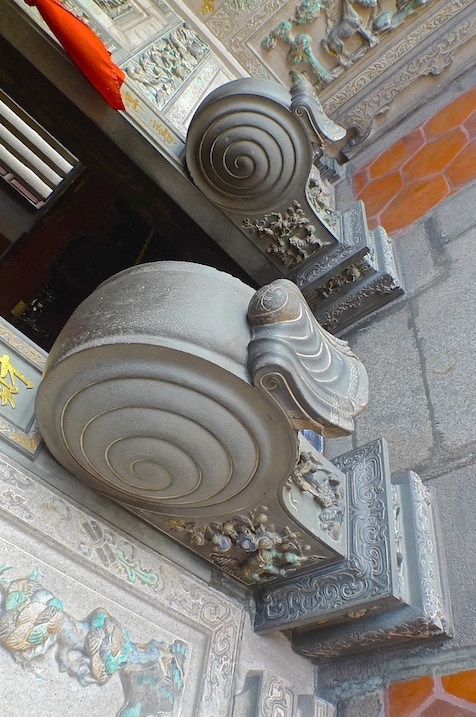 Honestly, every inch of this clan temple is filled with intricate carvings and ornamentations. As mentioned earlier, there are three halls on this top floor. I entered the Main Central Hall first as it was the biggest and most important. This central chamber has an altar dedicated to the Khoo's patron saints, Ong Soon and Tai Sai. There were lanterns and worship paraphernalia hanging from the ceiling. A closer shot of the altar. The walls in this hall were adorned with ink frescoes depicting the 36 celestial guardians of Chinese mythology. A closer shot of the ink frescoes. The celestial guardians appear to be of both sexes, each riding on different creatures and holding unique weapons. Next, I went into the Ancestral Hall on the left of the Main Hall. This hall which is smaller and more subdued, contains an altar for ancestral worship. On the wall on both sides are plaques of Khoo clansmen who have achieved academic excellence or recognition for their service to society. A close shot of the altar where the ancestral tablets are placed. These tablets were inscribed with the names of members of the Khoo clan who had departed. They were placed in rows according to the ancestors' position in the clan hierarchy. This is the door entrance to the God of Prosperity Hall. Notice the unique stone drums flanking both sides of the doorway. This small hall contains an altar to worship the God of Prosperity. Just like the Ancestral Hall, the walls in this hall were also lined with plaques of the members of the Khoo clan. Behind the three halls is a rear corridor that did not seem interesting to me until I spotted a few ink murals on the wall. 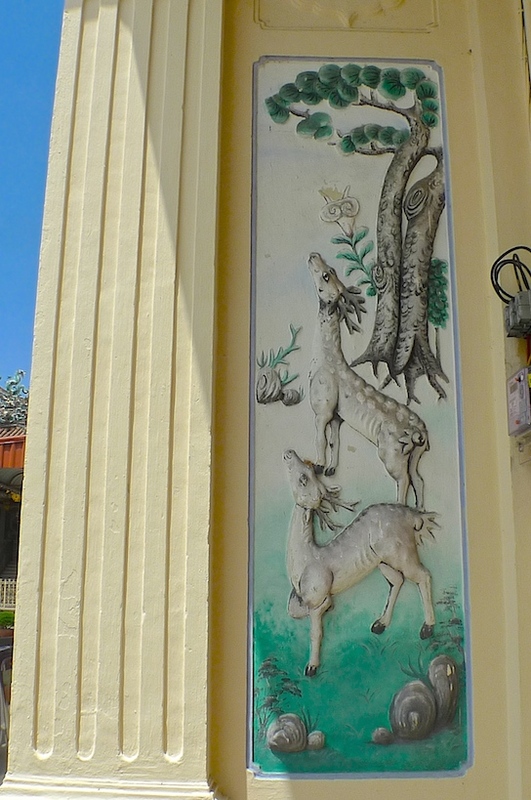 This is one of the murals that I took a picture of. The rest did not turn out well due to the dim lighting. It appears that these murals are almost a century old, making them one of the most important heritage paintings of this country. 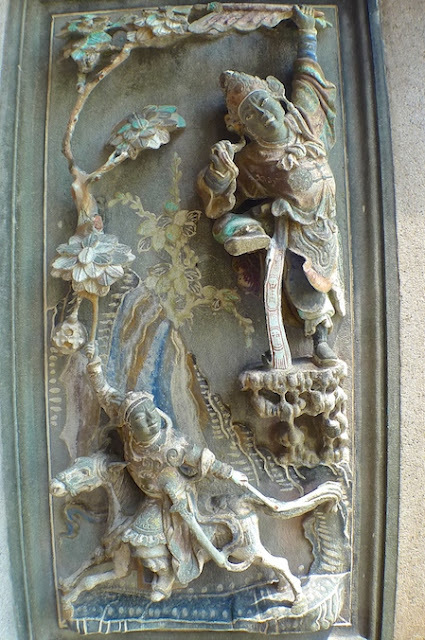 After completing my tour of the top floor, I went down to the ground floor of the Khoo Kongsi clan temple. There was a museum here but I did not take any photos except for this section that depicts the lifestyle of the Khoo family. OK, these life-sized statues gave me the creeps so I quickly took some photos and did not linger too long in there! Some of the cooking utensils on display. Just one last photo (from a different angle) of the Khoo family having their dinner before I left. I had no regrets visiting this clan temple. It is indeed an architectural marvel and a model example of heritage conservation and restoration. By the way, here's a little trivia. Did you know that the 1999 epic movie 'Anna & The King' starring Jodie Foster and Chow Yuen Fatt was partly filmed here? Rightly known as the Heritage Jewel of Penang, the Leong San Tong Khoo Kongsi is a 'Must Visit' for first timers to Penang.